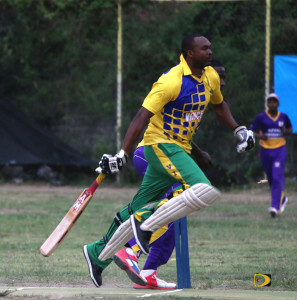 A new BVI Cricket Association Twenty 20 League Premier Division champion will be crowned, after 2014 champs Royal Knights flogged defending champs Vincy in Greenland on Sunday. Royal Knights will now face league new comers Road Town Wholesale on Sunday afternoon, with the winner advancing to face four time champs Cavaliers in the title game on May 7. Captain Richie Fredericks had been waiting for his batsmen to show up over their last several matches. Jomel Lafleur ignited a resurgent Royal Knights batsmen to a league best 298 runs, before turning back defending champions Vincy, for a 91 run victory. LaFleur and Fredericks engaged in a 165 run partnership for the third wicket before LeFleur was bowled by Sheldon John for a colorful 96. Fredericks then engaged in a 57-run partnership with Anthony Slowley, before Slowley was caught by Kenroy Cain, off the bowling of Kenrick Leslie, for 48. Fredericks was eventually run out by Vincy’s captain and bowler Brent DeFreitas, for a well-played 78 and Royal Knights went on to post the league’s highest score this second of 296 for 6. Leslie, 2 for 71 and DeFreitas, 2 for 41, were the pick of Vincy’s bowlers. Vincy was grateful to reach 205 in their 20 overs as Royal Knights players gave them second chances after drop catches. Neli Niles narrowly missed a half century with his patient 49. McTair James had a supporting 39 and Ferris Pope, a timely 37. Vincy’s Leslie said they had some unfortunate things going on with the team including the passing of DeFreitas’ mother and and Wicket Keeper Cameron Williams’ Grandmother, among other things. In Division I, Under The Tree used 79 not out from captain Earl Prince’s and another 62 not out from Terrance Warde, to flog Island Stars by eight wickets. Under The Tree chased down Island Stars’ 175 for 9, with a 177 for 2 reply. Wayne Phillip had a defiant 55 for Island Stars. Man of the Match Warde bagged 3 for 11 and Travis Jack, 2 for 30.